ACLS or Advanced Cardiovascular Life Support is a certification required by health care providers who deal with acute care or emergency services. This certification will give you the skills and knowledge needed in administering a set of extremely important interventions in the urgent treatment of life-threatening medical emergencies (such as cardiac arrest or stroke). Besides being a great way to expand your knowledge base and getting prepared to perfume advanced resuscitation, this certification is also required by most hospitals and emergency services in the US. Even more, it is important that you obtain the certification through the American Heart Association or AHA. It is important to make sure that your certification is supported by AHA because otherwise the certification won’t be valid. An AHA approved certification requires two steps: a written exam and a practical test where you prove your skills. There are two main paths to study for an ACLS certification: go to classes in your area or study at home using resources you can find online. If you decide to go with classes, you should look for hospitals or medical education facilities that provide the knowledge and first aid training. Of course, you will have to pay to attend these classes. If you don’t have the time to go to classes, you can always study on your own, but you must know how to choose your resources. There are many books and online courses that promise to get you through both the exam and practical test but only a few of them are the real deal. 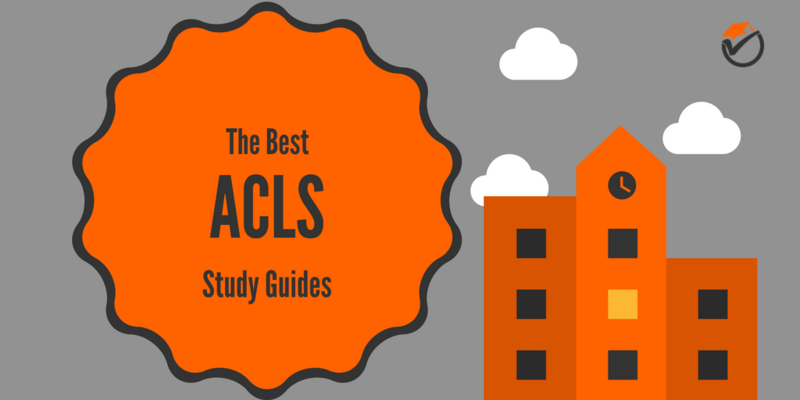 To help you choose, we put together a top 5 of the best ACLS study guides on the market. Below you can read our reviews and pros & cons on each resource. 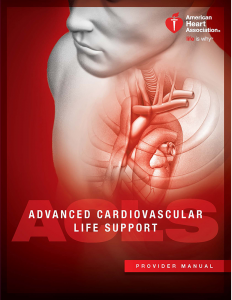 A great book for both certification and re-certification in ACLS, this guide of 208 pages is a must-have. The book is approved by the American Heart Association and the authors are the ones who actually put together the topics for the exam. It is also recommended for all ACLS classes so you can see why it must be your number one resource for your preparation. The guide offers detailed information on what you need to know for the exam and all the explanations are clear and to the point. Nothing is left out and you don’t have to learn extra like with some guides. We like that it comes with the ACLS Pocket Reference Card Set, a foldable insert that contains a condensed version of ACLS protocols. With this guide you’ll get the ACLS Acute Coronary Syndromes and Stroke card, and the ACLS Cardiac Arrest, Arrhythmias, and Their Treatment card. However, it has a weird structure so it may take you some time to organize everything in a more effective manner. Also, on the downside, we should mention that there are no practice tests or questions to help you organize your learning process and identify possible weaknesses. 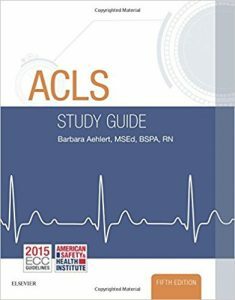 The ACLS Study Guide from ECC is one of the most complete and well-organized guides out there. In 424 pages, it teaches students about providing the best possible emergency cardiovascular care in an easy-to-read approach. The guide comes with hundreds of colorful photos and illustrations that make learning and understanding difficult concepts a lot easier. You’ll find everything you need, starting with airway management and ending with cardiac arrest rhythms and how to deal with the situation. There is also useful information on acute strokes and coronary syndromes, and electrical therapy which comes in handy when you have to prove your skills. The guide is updated with the latest ACLS algorithms and includes case studies to help you apply the theoretical knowledge to a real-life situation. Through case studies you’ll learn how to apply your skills in cardiac rhythm interpretation, administering the correct medication, and more. The best part is that the guide integrated case studies on each chapter. This way, you can apply the theoretical knowledge as soon as you learn it. The ACLS Study Guide, 5e also includes ACLS pearl boxes where you can read brief explanations on complex topics. This way, a difficult topic is broken into simple ideas, making it easier to understand and process. We also like the end-of-chapter quizzes. These are paramount for students who want to make sure they remember the information correctly. These quizzes will also help you learn about your weaknesses and assess your current state of preparedness. Finally, this guide is based on practice recommendations from the American Heart Association for Cardiopulmonary Resuscitation and Emergency Cardiovascular Care the 2015 International Consensus on Cardiopulmonary Resuscitation and Emergency Cardiovascular Care Science (with treatment recommendations). If you’re looking for a great guide for your ACLS preparation, the ACLS Review Made Incredibly Easy should be the perfect choice. The guide is organized in such a way that difficult concepts seem easy to understand and boring definitions are easy to remember. Such a fantastic content organization is possible due to step-by-step directions on treatment algorithms (the latest in the field) and easy to read reviews of the exam content. Even more, the content is addressing both first-time students and healthcare professionals. 2) Updated information on interventions such as basic life support skills, defibrillation and the adult cardiac arrest algorithm. Of course, this is a summary, but the information is a lot more comprehensive. Even more, the content is enhanced with colorful diagrams and illustrations that describe various interventions and core concepts. Besides reviewing the content for the exam, the guide also offers valuable information on how the exam works (to get you prepared for the atmosphere) and offers useful study strategies. The strategies include end-of-chapter quick quizzes and there is a practice test at the end of the book. 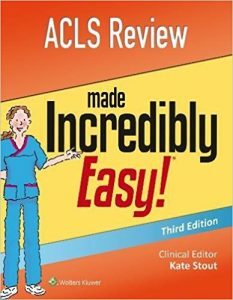 At the end of the day, the ACLS Review Made Incredibly Easy guide is a valuable resource in your kit. This is a small guide (only 104 pages) and it will only be useful in combination with one of the guides discussed above. First, you should know that this book is not supported by the American Heart Association (which is against our recommendations). However, it is in top 5 resources we propose because it comes in handy when you want to review the knowledge you gathered. Please keep in mind that the information mentioned above is in a compacted form and the guide won’t be helpful if you’re not already familiar with the concepts. Finally, the guide ends with 160 review questions, which is, probably, the most appreciated part. This 130-pages guide for ACLS exam preparation is up to date with the latest procedures and treatment algorithms. The content is well-organized and the concepts are well explained, but not everything is covered. This is what makes this guide better for review sessions than for learning from scratch. Many professionals find it useful due to the well-designed reviews and the updates on the latest guidelines and research in the field. Even more, the price is quite affordable and besides the necessary material, the guide comes with 101 practice questions. All the questions are designed to simulate the exam to make sure all students will be prepared for the atmosphere. Still, if you’re already familiar with the exam, you can use these questions in identifying your weaknesses and assessing the situation of your preparedness. 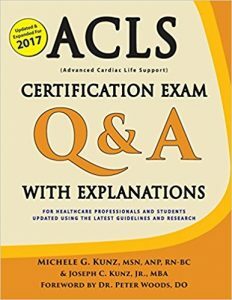 The ‘ACLS Certification Exam Q & A with Explanations’ is mostly oriented towards healthcare professionals (physicians, nurses, paramedics, residents, dentists) who need to re-certify their ACLS. Still, it will be just as helpful to people who are taking the exam for the first time and went through all the necessary resources. The author likes to keep in touch with the students so he created a YouTube channel where you can watch more in-depth explanations as for how to use the guide and how it can help (more information about this in the guide). Also, you can email the author with various questions about the book or about life as an ACLS graduate. On the downside, many students complained about the amount of typos throughout the book. However, this can be put aside if you consider this guide’s value for both students and healthcare professionals. ACLS is no joke and the exam is among the most difficult ones you’ll ever have to take. After all, you will have to know how to react in emergency situations and how to apply the correct procedure when your patient’s life is hanging by a thread. There will be no room for mistakes! Still, with the right resources, you will pass the exam with astonishing results and you’ll get to practice saving lives every day. If this is what you want, we recommend starting with the first item on our list (Advanced Cardiovascular Life Support (ACLS) Provider Manual 2015 Guidelines). It may be a bit more expensive, but it is AHA approved and comes with everything you need to know. 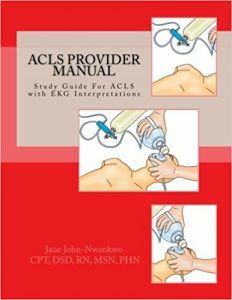 If you feel adventurous and want to explore more in-depth, we recommend the ACLS Study Guide, 5e (second item on our list). It is affordable and comes with more in-depth information (compared to what you need for the exam). Finally, if you’re looking for guides to help you review what you already know, take a look at the ACLS Provider Manual Study Guide and the ACLS Certification Exam Q & A with Explanations. These are both easy to browse and quite affordable.